As the industrial revolution enters its fourth stage, technical communication is evolving in parallel. The challenge for technical communicators is to develop new methods of creating, managing, and storing content that are compatible with the latest delivery channels – to close the gap between the more traditional technical communication methods and the requirements that Industry 4.0 and emerging technologies bring. Information 4.0 is the technical communication community’s response to Industry 4.0. 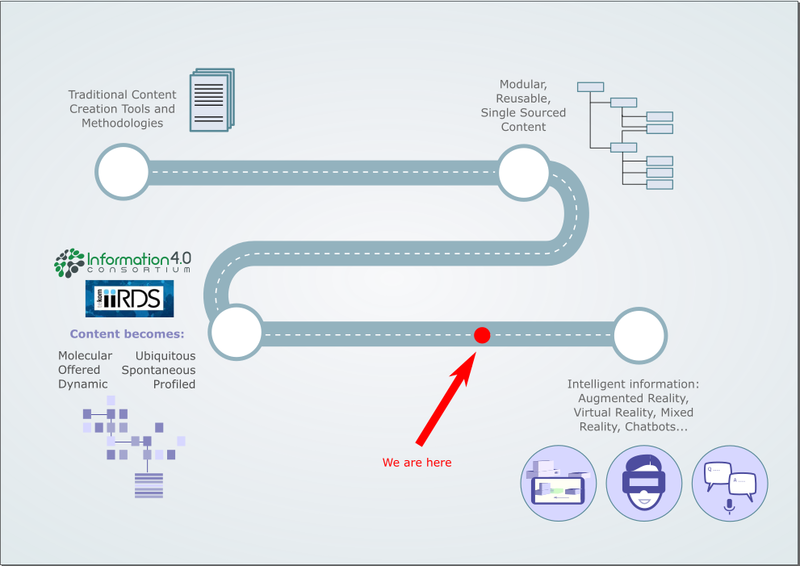 Information 4.0 examines concepts, strategies, and standards that technical communicators can implement to deliver intelligent information to smart portals and applications. With Information 4.0, content creation will require more expertise, strategy, and precision than ever before. What are some of the trends in Industry 4.0 and emerging technologies that have an impact on Information 4.0? With Information 4.0, the traditional document with its paged structure, table of contents, glossaries, appendices, etc., is no longer considered an adequate method of knowledge transfer. As business and industry integrate technology deeper and deeper into their daily tasks, users will come to expect the right information at the right time, in the right delivery format. Delivery formats will become more tailored to suit the information being delivered and the environment in which the content is being accessed. For example, if a maintenance technician is repairing a machine in a manufacturing facility, they might use a mixed or augmented reality (MR/AR) headset or glasses such as Microsoft HoloLens or DAQRI Smart Glasses to access hands-free instructions that are tailored to the displayed error code on the machine. Chatbots will continue to gain popularity and compete with traditional web interfaces for query-response information retrieval. Chatbots can provide real-time, tailored answers to specific user questions, using information from stored datasets, microcontent, real-time data from IoT sensors, etc. Microcontent is the smallest part of the content that can retain its validity in context. It provides one notion or idea and has a unique purpose. In the case of chatbots, a piece of molecular content functions as a response to a user intent. Creating new content just for chatbots is not sustainable. It’s better to restructure existing content as microcontent so that it is correctly formatted for chatbots, virtual assistants, or any future query-response delivery channel. Restructuring existing content also supports single sourcing. How has the technical communication community started bridging the gap between traditional content delivery and Information 4.0? The technical communication community has been working hard to redefine how content is created, managed, and stored. Two notable consortiums that have emerged are the Information 4.0 consortium and the iiRDS consortium. Molecular – For the past 10 years a large portion of technical communicators have been authoring content using the DITA structure which supports modular content creation, single sourcing, and reuse. With Information 4.0, content is going to become even more granular. Dynamic – Content is automatically updated based on analysis of content metrics and customer interactions. Offered – Content is created and stored as molecular chunks of information, which are then assembled depending on context and delivered when the user requests it. Ubiquitous – Content is online, searchable, and findable. It is also single-sourced with multiple delivery channels. Spontaneous – Information is assembled and displayed in real time based on the context of information requests. Profiled Automatically – Content is no longer generic. The information delivered is aligned with the user profile and their needs. A working group within the Information 4.0 consortium worked on the iiRDS standard before breaking out into its own consortium. Content can be aggregated from various sources. Enriched metadata structures are ideal for request-delivery channels. The metadata in the iiRDS is richly defined and is connected together in an ontology. Filter conditions are used to deliver targeted context-specific information – for example a list of supplies for a particular task. iiRDS-compliant information is read and processed by iiRDS consumers. These applications find and assemble content based on various context factors, product types, tasks, events types, information types, or user types. The iiRDS consumer can also filter this information to further target the user’s requirements. The iiRDS consumer renders the content so that it appears correctly on the delivery portal or application. As the iiRDS standard and Information 4.0 concepts and strategies gain traction, technical communicators are assessing how moving towards Information 4.0 will impact on them and their organisations. We are on the cusp of some very exciting changes in our industry. The way we’ve been authoring content is going to change, and it’s going to keep changing as we continue to keep pace with emerging technologies. We’re not there yet, but the technical communication community is well on its way to delivering intelligent information that is dynamic, context-responsive, easy to access, and more useful than ever before. Emily has a background in IT and has worked for many years in publishing. Combining these disciplines, technical communication was the next logical step. Emily has worked as a technical writer/information developer since 2011. This is an excellent recap of where we are, thank you for posting it. One detail: iiRDS did not start inside the Information 4.0 Consortium, it was started by TEKOM. Of course, there is lots of contact and exchange between the two consortia, and we are working to collaborate so as to produce coherent results. Thanks for this clarification, Ray. We’re delighted to hear you enjoyed Emily’s post.